Our magnificent Playground Castles promote active play and encourage both role play and den-making activities. There is space on top of the castle for child-led games and storytelling and space underneath for quiet time and den building. The castle has been made to offer multiple access points and will test and develop children's gross motor skills. 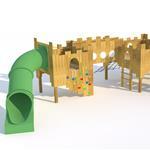 Check out our Langley Play Castle which is ideal for EYFS and KS1 children.